SPARTATM, the ESO Standard Platform for Adaptive optics Real Time Applications, is the real time computing platform serving 3 major 2nd generation instruments at the VLT (SPHERE, GALACSI and GRAAL) with plans to serve more, smaller, instruments in the near future. SPARTA offers a very modular and fine-grained architecture which is generic enough to serve a variety of AO systems. SPARTA includes the definitions of all the interfaces between those modules and provides libraries and tools to implement and test the various modules as well as a map to technologies capable of delivering the required performance, most of them innovative with respect to ESO standards in use. For the above mentioned instruments, SPARTA provides also a complete implementation of the AO application, with features customized for each of the 3 instruments. We present here the architecture of SPARTA, its technologies, functions, performance and test tools as well as the plans to increase the reach of the platform to smaller system with what we call SPARTA Light. The ESO AO simulation tool (OCTOPUS) aims at simulating large AO systems such as those found in the Adaptive Optics Facility or the E-ELT. We simulate AO systems. The major part of our simulations is made with the Adaptive Optics simulation tool Octopus, which is able to simulate full AO systems. We also sometimes need to simulate specific parts of an AO system, to study or solve particular issues (spot elongation with laser guide stars, tip-tilt sensitivity, …) for which we develop dedicated reduced simulating tools.We describe here Octopus, our main simulation tool, and what we can achieve with it. Adaptive optics systems strongly rely on low noise fast read-out detectors (in the visible and in the near infrared) for wavefront sensing. The type of detectors depends on the wavefront sensor concept: CCD or CMOS detectors for Shack-Hartmann/pyramid wavefront sensors and avalanche photo diode detectors for curvature wavefront sensors. Since the 90s, ESO has supported the development or make use of these detectors for its existing adaptive optics systems. NAOS/CONICA is equipped with visible and infrared Shack-Hartmann wavefront sensors using respectively the E2V CCD 50 specially developed for this application and the Rockwell Hawaii I detector in an optimized read-out mode. 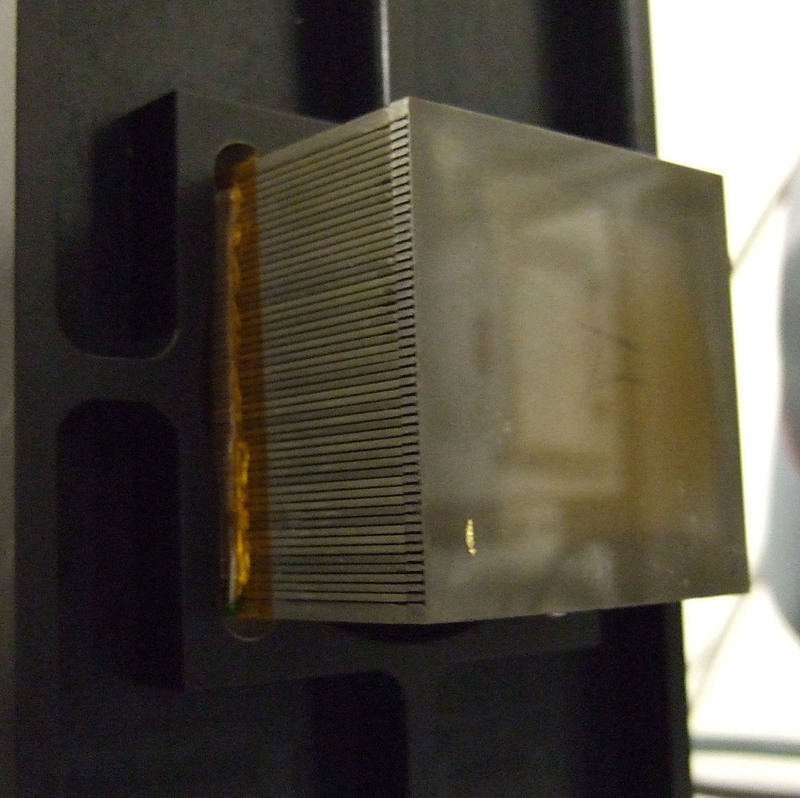 MACAO/SINFONI/CRIRES adaptive optics system, based on visible curvature wavefront sensors are making use of visible avalanche photodiode manufactured by Perkin-Elmer. MAD based on visible SHack-Hartmann and pyramid wavefront sensors is making use of the thw E2V CCD 39. SPHERE and AOF based on a visible high order Shack-Hartmann wavefront sensor are making use of specifically developed L3CCD detectors(CCD220) from E2V. For the future adaptive optics systems for the E-ELT, ESO is pursuing a development of natural and laser guide stars Shack-Hartmann wavefront sensor detector aiming at fulfilling the requirements of the first generation systems at the E-ELT. More information can be find at the following link. For both the adaptive optics wavefront sensing/fringe tracking at the VLT and the low order wavefront sensing at the E-ELT, the need for low noise fast read-out infrared detector has been identified and the development is been pursued by the infrared department at ESO. The development of deformable mirrors technologies is made through European Commission Programmes with the involvement of industry. In the frame of FP6 opticon JRA1, ESO pushed forward the development of small deformable mirrors with voice coil actuators. 97 actuators magnetic deformable mirror with 1.5mm pitch was successfully developed providing more than 30 micron on 3x3 actuator and more then 3 micron inter-actuator stroke.